White bass; photo © Brian Jorg / CritterZone: Animal - Wildlife - Nature Stock Photography (all rights reserved; used by permission). 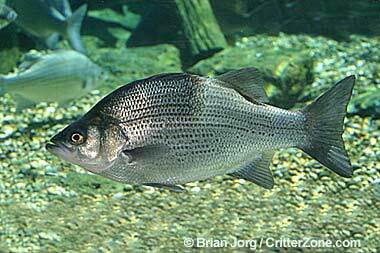 White bass, also called sand bass, are silver with narrow horizontal black stripes. They are a freshwater fish found living in lakes, ponds and rivers. 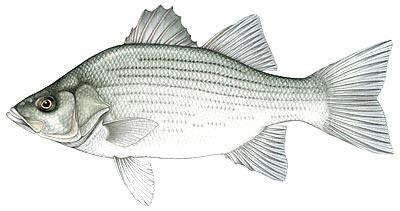 White bass sketch; public domain image on Wikipedia.